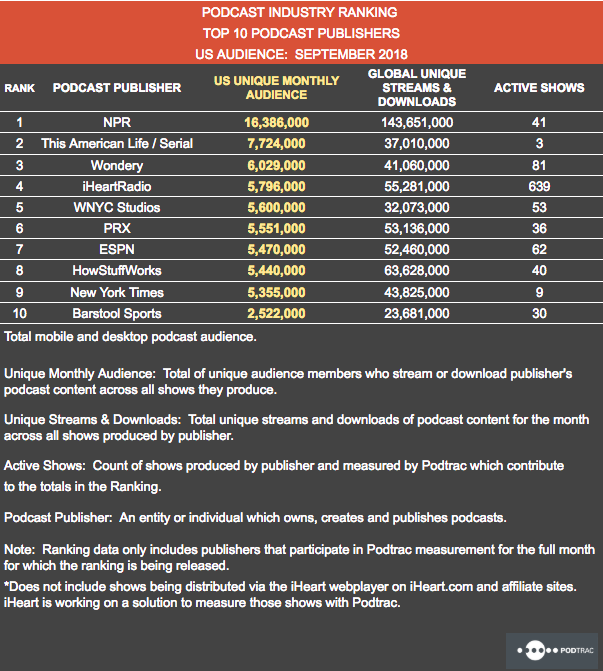 The Top 10 Podcast Publishers ranking for September 2018 is now available at Podtrac.com. Eight of the Top 10 Publishers showed gains in their Unique US Monthly Audience in September over August. This American Life/Serial returns to the #2 spot with the release of season 3 of Serial while Wondery moves to #3 on the strength of their new show Dr. Death. Total Global Downloads for the Top 10 Publishers is up 10 % in September over August. Total Global Downloads for the Top 10 Publishers is up 63% year-over-year.